Last night I tested out an inexpensive super-wide-angle 6mm C-mount lens hooked up to my QHYIII178 color CMOS camera (without the IR cut filter, which is why the trees are a bit odd looking). It was pretty cloudy to start and the whole view was fogged in by 3am, but I still managed to get the Milky Way as it was sweeping up and across the sky. This camera + lens would make a nice all-sky type setup, but I'm thinking about using this to capture the full night sky when we have meteor showers--the Lyrids, Perseids, Geminids. This shot is from one of the third-floor windows, facing east. (Our attic is finished). 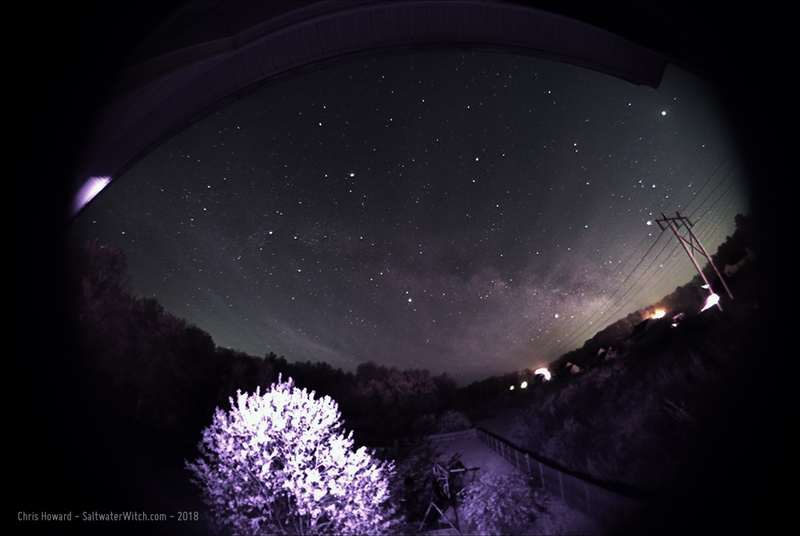 I can stick the camera with a long USB3 cable on the end of an 8-foot length of PVC pipe--out the same window--to get it above the roof of the house and get the whole sky in view. Then I can use SharpCap (https://www.sharpcap.co.uk) to capture several thousand 10-second frames over the course of the night, and bring them together into a video. Now with video and me talking! Night Sky Video test with the QHYIII178C CMOS camera and 6mm wide-angle lens--with me yapping about the camera and other equipment, explaining settings and other interesting stuff about this all-sky setup. My plan is to use this the next time our planet's orbit takes us through the path of some comet's orbit. (one of the ways we get seasonal meteor showers).